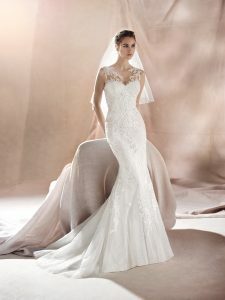 Exquisite mermaid wedding dress with an embroidered tulle sweetheart neckline. Guipure and thread embroidery adorn the dress and the tulle that blends in with the skin in the bateau illusion neckline. Our stunning sample is in lovely condition in ivory in a size 12. By submitting a comment you grant The Wedding HQ a perpetual license to reproduce your words and name/web site in attribution. Inappropriate and irrelevant comments will be removed at an admin's discretion. Your email is used for verification purposes only, it will never be shared. Madrid bridal White One 2018 Collection Preview!